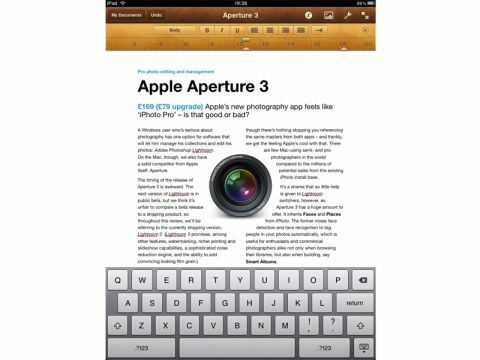 Just like on the Mac, Pages for the iPad is a mix of straight word processor and desktop-publishing package. Apple's probably right that, unlike the writers at MacFormat, most people don't think of a word processor as a way of simply belting some unformatted text into a computer, but instead like to tinker with layout, fonts, images and more. Which is just as well, as while Pages on the iPad is rather impressive when doing moderately sophisticated page layout, it's not conducive to the kind of word processing that journalists, students and academics usually do. It's easy – almost fun – to set page margins and headers/footers. You can create multi-column layouts and even, as in the screenshot, drop in graphics and have text flow around them. There are a few pretty templates included. It even has a spellcheck. But crucially, there's no word count. We know that not everyone who writes, writes to a word count, but it's vital for many. As with the other iWork apps, getting assets into your documents requires you to sync them awkwardly through iTunes or copy them from elsewhere, such as a website. Though the iPad's keyboard is technically very good, it's tricky to sit the iPad in a position where long periods of typing are comfortable; happily, a dock and paired Bluetooth keyboard works great. However, you can't print. That seems basic, and while we understand the technical reasons for it, it's just nuts; at least let us automate passing a PDF through a helper app on a local Mac, Apple! But no, instead you're limited to mailing or exporting the file digitally (Keynote and Numbers can't export to their Office equivalents, but Word is an option that's provided here). What plagues all iWork apps on the iPad, however, is the tortuous method of getting files to and from your Mac. It's handled through a pane in iTunes, but it's not file syncing. You have to convert transfers each way, creating a litter of versions and sometimes messing up complex formatting. In this way, it's all too easy to lose track of which copy is the latest version. If you're content to spend most of your time in Pages on the iPad, rarely working on the file on your Mac, and are happy to treat your work as DTP projects rather than word processing documents, Pages can be forgiven.